Wash and peel carrots; cut into sticks then place onto a baking sheet. Whisk together ground mustard, honey and salt. Drizzle half the mixture evenly over the carrots. Bake for 15-20 minutes until tender; remove from oven and drizzle with remaining honey-mustard. Cover with foil until ready to serve. In a shallow bowl, whisk together the eggs and water; set aside. Place the flour in a shallow dish, large enough to spread out for dredging. Mix the Panko, coconut and paprika in a separate shallow dish (pie plates work great). Dip each fish filet into the egg wash, then the flour, and finally into the coconut mixture, making sure to coat both sides. Set onto plate. Heat oil in a large skillet over medium heat for 3-5 minutes. This will ensure hot oil and a nice crispy coating on the fish. Place each fillet into the hot oil, being sure to not over-crowd the fish. If needed, cook only 1-2 pieces at a time, adding more oil if needed. While the fish cooks, dice mango and onion; toss together with chopped cilantro and the juice of one lime. Set aside. 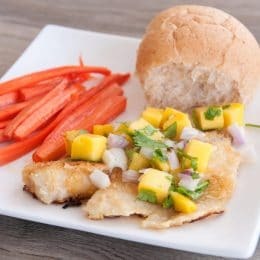 Serve fish topped with mango salsa; spritz with extra lime juice as desired. Serve carrots and rolls on the side.